As is often the case with new developments in consumer electronics, cost is a big influence on the rate of adoption. Indeed, the price of digital TV recorders has fallen dramatically over the past year or so, meaning the benefits of tape-free recording are finally getting across to the public. Consider the Digihome PVR160, for example; it packs in twin tuners and a 160GB hard disk (enough storage for 80 hours of TV) for £120 (minus a penny). On paper, it's a steal, while an 80GB version (the PVR80) is also available for an equally impressive £90. Looks-wise, it's not the slickest PVR of its kind; it has a bland, silvery exterior and a fascia adorned with tacky-looking operating buttons. There's also a flap on the right-hand side concealing a blanked-off card slot (no Top Up TV support here). There's also a large blue LED display indicating among other things the channel you're on, which is particularly useful if you want to listen to radio channels without wanting to have the TV on at the same time. The remote control has an odd spatula-esque shape to it but remains comfortable to hold - lightweight and blessed with a well-considered button arrangement. The back panel also punches above its weight for a budget box. There are four UHF connectors, although two are linked with a patch cable (to link the tuners). This leaves the remainder acting as a UHF loopthrough suitable for piping an analogue signal to your TV. AV support comprises two Scarts with composite and S-video support, plus RGB for the TV Scart. There's also a separate composite output, analogue phonos and an optical digital audio output and an RS232 port for updates (also broadcast over the air). Tuning in proved a speedy process, although the Digihome struggled to pull in a strong signal from some channels where other PVRs proved more capable. Pressing OK calls up the main channel list, where channels can be re-ordered, renamed or deleted. You can also create up to five favourites lists. The EPG shows a grid of channels and seven days' worth of information that can be viewed day by day. You can shrink it or expand it to fit more information onscreen and a red bar indicates what the current time is. You can also choose to have programmes highlighted by choosing from a list of genres. Recordings of TV and radio channels can be set from the EPG, the now-and-next programme information bar, or by using a manual timer with once daily or weekly repeat options. 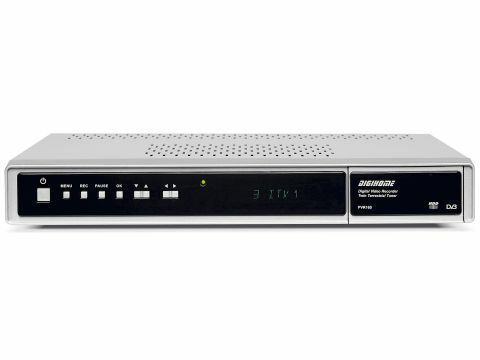 Although the PVR160 is blessed with twin tuners, you cannot record two channels at the same time or 'timeshift' one channel while another is being recorded. This may not be missed by PVR newbies, but it is part of the appeal of digital recorders for many enthusiasts. You can set a buffer of 10 minutes either side of a recording to avoid overrun and specify options for discarding recordings when disk space is limited, including whether to deleted the shortest, longest or unplayed recordings. Recordings are stored in the library along with their name and channel while the list of recordings can be re-sorted in numerous ways into oldest newest, longest viewed and unviewed. It's possible to watch a recording while it's still being recorded and resume watching it from where you left off. You cannot, however, edit them afterwards. Timeshifting (up to a maximum of two hours) is supported but only gets underway when you press pause. When timeshifting and recording you can fast-forward and rewind at x1, x2, x4, x8, x16 and x32 normal speed, a relatively glitch-free process - although we did experience some jerkiness when timeshifting. A progress bar would also have been welcome. Teletext is supported and is markedly quick to load and there's also a quarter-screen picture-in-picture option. Unfortunately, the PVR160 generates noticeably soft pictures on the whole, with a thin but noticeable patina of artefacting evident on most channels that tends to obscure detail. This becomes more of an issue when viewing on a 32in TV or above. Predictably, audio quality is sharper from the optical digital audio outputs rather than the stereo phonos, but we have no reservations with either. The Digihome is a reliable, beginner-friendly PVR with some great features for the money. However, the lack of dual recording and middling picture quality means it stops short of a really good score.